Welcome to the Black & Teal Brigade Website! 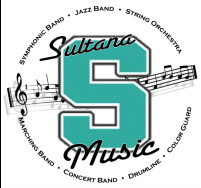 This site is devoted to the Sultana High School Instrumental Music Program from Hesperia, California. Here you will find information about our Black & Teal Brigade marching band, concert and symphonic bands, string orchestra, color guard and percussion ensemble, as well as the Sultana Band Booster program and its activities. Also available are useful resources for students, including links to important documents, warm-ups and practice etudes, private lesson instructors, downloadable forms, contact information, a calendar of all band-related events, and more. Mr. Joe Costantino, Director of Bands, Larry Bird, Principal, and the Sultana Band Boosters are committed to making the Sultana Instrumental Music program the best in the High Desert and throughout Southern California. Come in and take a look at what we've accomplished! Support the Band! Shop on Amazon! Supporting the band has never been easier! Now, qualifying purchases made on Amazon.com with "Sultana Band Boosters" chosen as the organization you support will earn them a percentage back on your purchase. Just look for the icon that says "Amazon Smile!". Click on the banner below to start your next purchase, be sure to spread the word, and happy shopping!